Whether you are concerned about an ongoing foot, knee, or hip problem, have faulty foot mechanics, are an active person on your feet, or want to improve your body’s performance, orthotics may be for you. A thorough biomechanical analysis and custom fitting will allow us to produce the ideal orthotics for you, which will improve your performance and efficiency, reduce pain, and contribute to your body’s overall wellness. Faulty foot mechanics may lead to a number of overuse syndromes that can produce localized foot pain and/or leg, knee, hip and even pain into the spine. 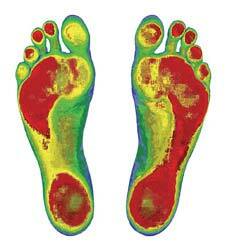 Custom orthotics are biomechanical medical appliances that are custom made to correct your specific foot imbalance. They work on your feet much like glasses work on your eyes- they reduce stress and strain on your body by bringing your feet back into proper alignment. Our orthotics are designed to fit into your shoes as comfortably as an insole. At Trinity Chiropractic we offer high-quality custom made orthotics manufactured by The Orthotics Group. How do you get your orthotics? Book an appointment to have your biomechanics evaluated. If you are a candidate, we will carefully take a semi-weight bearing mold of your feet in a neutral position. We then select the materials and style of orthotic based upon your specific needs. Our lab in Toronto will manufacture your orthotics based on our specifications and return them to us so that together we can ensure they are the perfect fit.